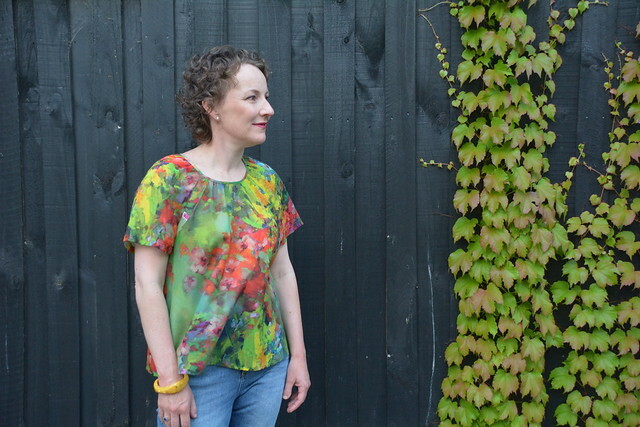 Long time blog readers won’t be surprised to hear that I’m a big Pattern Fantastique fan. 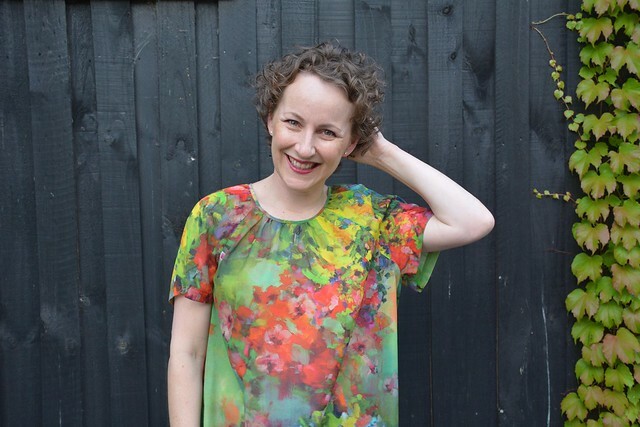 Drafting is Nita-Jane’s super power and the styles are chic, modern and very wearable. I first sewed one of their patterns in January 2015 (four years ago) and I’m still wearing that red dress! 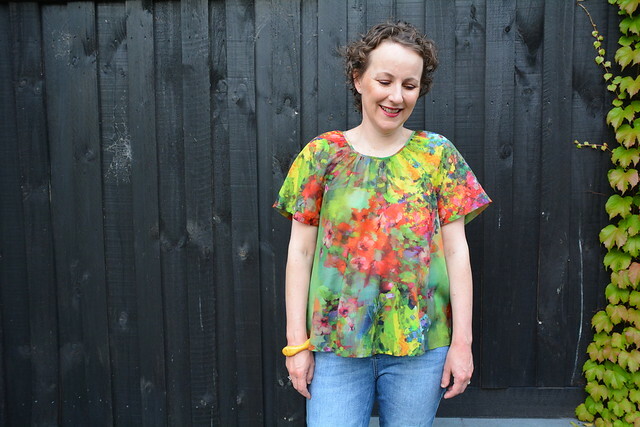 I was a pattern tester for the recently released Calyx Smock and I’m sharing my finished top (there is a dress option too) with you today. This is the version with the shorter sleeves. 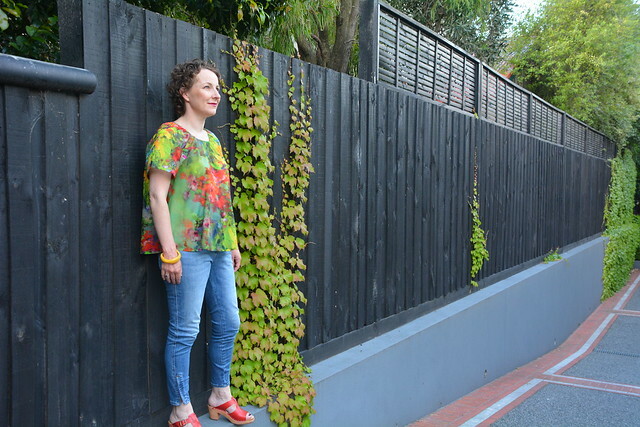 I sewed a size 10 and the only change I made was to shorten the pattern by 1″ (2.5cm). The pattern comes with two hemming options, a facing and a narrow folded hem, and I chose the latter option. This fabric is from deep stash. 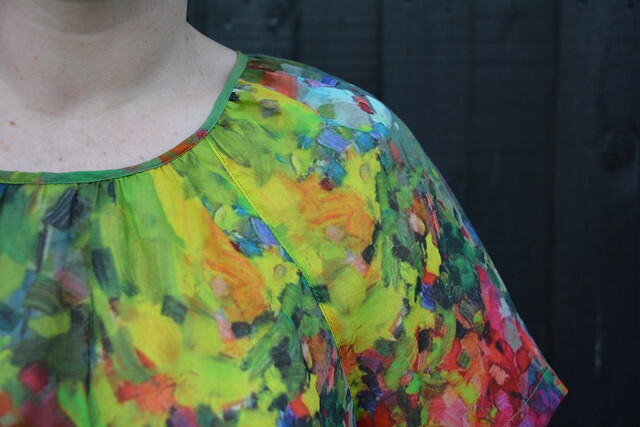 It’s a cotton/silk blend and you won’t be surprised to hear that when I purchased it at The Cloth Shop a few years ago I was attracted to the lovely bright colours. 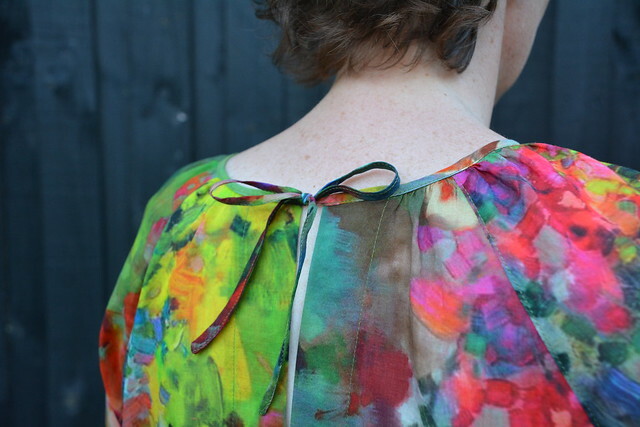 The fabric was the perfect weight for a summery gathered smock top. The neckline binding closes at the back with a tie and the deep back seam allowances are top stitched for added interest. 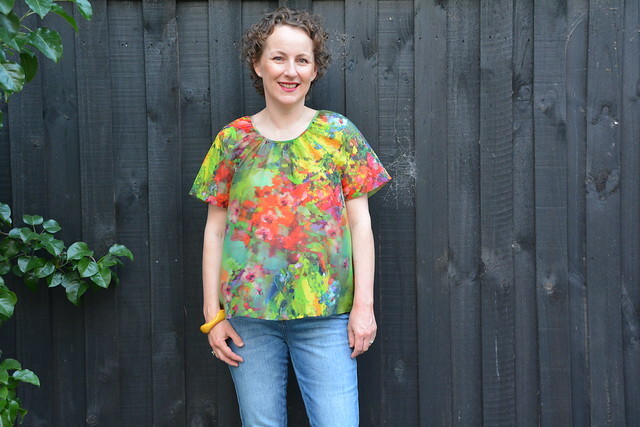 This is a very easy top to sew and wear. I’m sure it won’t be the last time I sew this pattern. Alterations: I removed 1″ (2.5cm) from the length of the top. Accessories: Random mustard bangle in my possession and Funkis shoes purchased second hand in as-new condition. 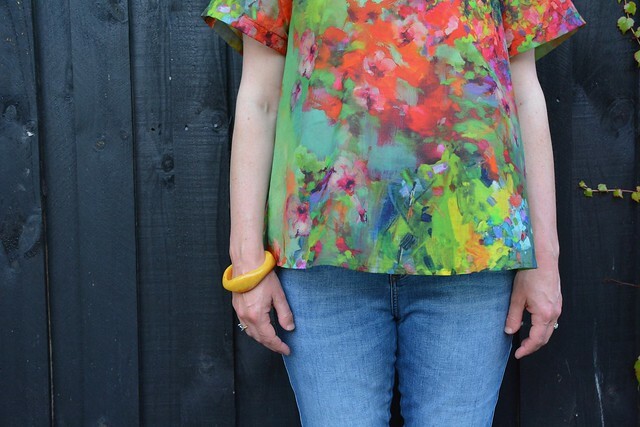 I do love wearing brights… and all the colours all at once. My Funkis shoes are fabulous. Surprisingly comfortable and they just seem to go with everything! A great neckline and I very much like the raglan sleeves. Raglan sleeves are my favourite! Random mustard bangle: yeah, weren’t they a post-punk band, late ’70s, out of Manchester? Glorious top! And I’ve a feeling we’ve not seen the last Calyx of ’19. And yes, of course, it’s too soon to say that anything’s your best make of the year because whatever you make is always better than the last thing you’ve made–your annoying and relentless tendency towards excellence. My perfectionism gene is strong isn’t it? Thanks for the Calyx love… and yes, I’m sure there will be a sequel in 2019!